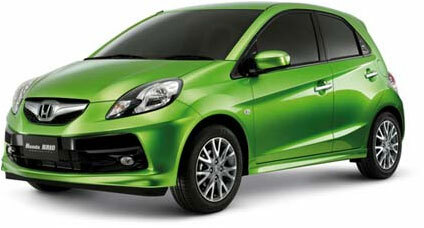 The Honda Brio is planned for launch in South Africa in December 2012. It’s a zippy small car with a surprising amount of space, designed for driving about town and commuting. Beyond its fun, funky looks, the Brio is a fun easy drive, with a light clutch and a smooth gearbox. As you would expect from Honda, the Brio is engineered with the latest safety equipment including front airbags, font pretensioner seat belts, anti-lock brakes and electronic brake distributors. With a 1.2-litre i-VTEC engine, the Brio delivers both fuel efficiency and performance, with a clever ‘ECO’ indicator which shows when you are driving with less gas. Available in both manual and automatic, the latest-generation 4-cylinder engine has intelligent, electronically controlled variable valve timing, with 4 valves per cylinder, to produce 65kW, together with 109Nm. The Bio is Honda-engineered, so is a supremely stable set of wheels, with well-tuned suspension, tight steering and is able to handle small corners and fast lane changes superbly. You certainly won’t be mistaking the Brio for any other small car, with distinctive sleek lines and looks. It’s wide and spacious, seating three comfortably in the rear, with ample legroom in the front. "The Brio is poised to become a trend-setter in the entry-level segment, and will allow Honda to introduce the Honda motoring experience to a wider audience for the first time. The Brio's combination of styling, affordability, quality - and, above all, motoring fun - will offer young first-time buyers an attractive budget motoring option." Topgear.com - (Honda) wants to reclaim its glory sales days… and the Brio, unfortunately for the competition, is the car that may just do the trick. The new Honda Brio is planned to be available in South Africa in December 2012. Contact your local Honda dealer to be among the first lucky owners! Indexmotor.com - Automotive Directory and information on the web.